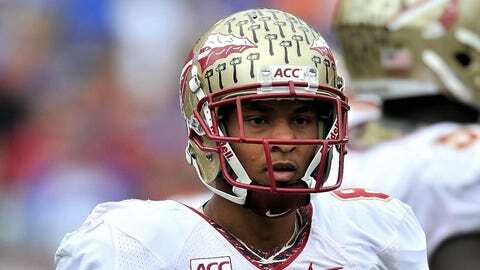 Rashad Greene was Florida State's leader in both receptions and receiving yards in 2013. The road to a repeat may have just gotten a little easier for the Florida State Seminoles, as a trio of three juniors decided to return to the school for their final season of eligibility. Offensive tackle Cameron Erving, wide receiver Rashad Greene and offensive guard Tre’ Jackson all announced Wednesday they would be staying in Tallahassee for their senior seasons. The Seminoles, coming off a perfect season and a thrilling victory over Auburn in the final BCS championship on Monday night, figured to be in decent shape for 2014 even if a handful of underclassmen decided to enter the NFL Draft. Among those who players who have not officially made a decision on returning are WR Kelvin Benjamin (redshirt sophomore), running backs James Wilder Jr., Karlos Williams and Devonta Freeman (all juniors), tight end Nick O’Leary (junior) and defensive tackle Timmy Jernigan (also a junior).